The North Island chapter is pleased to present the Bronze Medal on December 8th 1998 to a very deserving couple, Len and Madeleine Simmons. Len and Madeleine are long-time members of our chapter who have worked tirelessly for many years in support of the many activities involving our group. They have assisted in the organization and operation of our annual plant sales with Madeleine being in charge of finances for several years. Len and Madeleine’s contributions of flowers to the truss shows have added immeasurably to the show’s success and have been greatly appreciated. 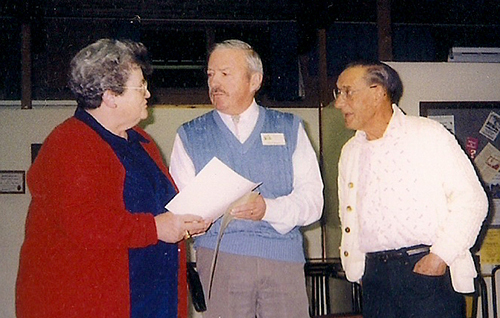 Madeleine served on the executive of our chapter for a period in the 1980s. During our monthly meetings, Len and Madeleine frequently bring in trusses from their garden to show and discuss with other members and are eager to share their considerable knowledge of rhododendrons and companion plants. Len’s organization of the slide show at our annual Christmas party for several years was always a great hit. In the past few years, Len and Madeleine have taken on an ambitious project to create a large rhododendron garden at their home site, literally carving it out of the wilderness. Their progress has been truly remarkable. The garden has been “on tour” to the public and has been a great inspiration to all who have had the pleasure of visiting it. Len and Madeleine, for your many contributions over the years, the North Island Chapter is most grateful. Thank you.